Regime Superman and Bizarro contest with each other, while also dealing with Solomon Grundy. Their battle yields no victor, as Bizarro flows off, distraught at not being accepted as the genuine Superman. 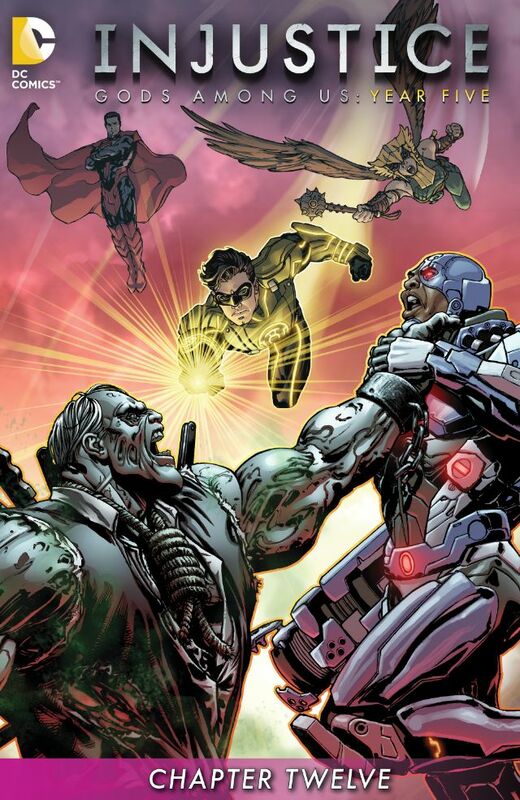 Regime decapitates Solomon Grundy, and leaves him with Lex Luthor... to do Science. Story - 3: Well, it was nice while it lasted. Two issues of good storytelling only to be usurped by this return to ill-form. The difficulty in Regime Superman addressing this problem more succinctly is stifling, because after Bizarro leaves, that's exactly what he does. Regime could have decapitated Solomon Grundy from a distance and then dealt strictly with Bizarro, providing an area for the two to battle, or reason, if you will. Instead Buccellato gives us a Keystone Cops match-up, with Grundy needlessly in the way. Yellow Lantern's arrival (when is he going to be Green Again?) does absolutely nothing for the story, and one shouldn't be surprised as Yellow Lantern has done absolutely nothing for quite some time. His constructs are made simply to be broken, and a character with so much ability should never come across as this ineffectual. Regime's decision to let Bizarro go is mind-boggling. Bizarro doesn't necessarily need to be apprehended, but he should be monitored at the very least. Lex Luthor's role in this story is surreptitious to a buffoon. Batman's Insurgency has the green-pill, and Regime Superman has no idea how that happened. Both sides are running low on the upper, and he's still not putting it together. Regime has questioned Lex's loyalty, which means the bloke isn't loyal. A Bizarro of Regime shows and there's only one man on the planet with the time and facilities to make it happen. Regime may be a dunce, but how do readers accept this malarkey? If Lex is to be a double agent, he should at least be a good one. However, it seems that good storytelling just doesn't matter these days. Frank Miller hasn't written anything worthwhile with superheroes in decades, yet place his name on any project, and it's guaranteed to sell, even if it's bad. Even if readers know it's bad. Why clean up your act and improve, if your readership will accept smeared offal on a lovely piece of toast? Injustice is in good company. Art - 4: The best images are those of Regime and Bizarro facing each other, and looking so very different.